The Summer Festival is hosted by The Busy Bodies of Bayou Vista. Call 935-9156 if you would like to volunteer or be a sponsor for any of the events. Proceeds go to beautification and mosquito control for Bayou Vista. Donations are also made to Ronald McDonald House - "From Our House to Your House". Bayou Vista Summer Festival Raffle tickets results. Golf Tournament - May 25, 2004 at Bayou Golf Club in Texas City. Adult and Youth Fishing Tournament - Wednesday, May 26 - Sunday, May 30th. Click on icon for Fishing Tournament Results and photos of the kids games in the Bayou Vista park. Bar-B-Que Cook-Off Saturday May 29th. Click on icon for results and photos. 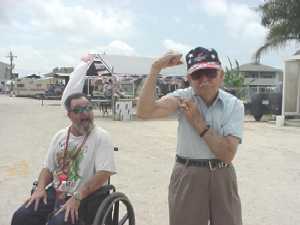 90 year old Raymond Tacquard shows off his muscles at the BBQ cook-off, while others enjoyed checking out the race car the police department had on display. Pancake Breakfast, Memorial Day Parade and NASA display - Saturday May 29th. This website is courtesy of Gulf Coast Computers in Bayou Vista Shopping Center 409- 935-9544. 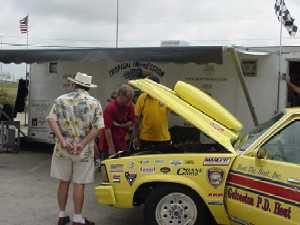 Please check out past years of the Bayou Vista Summer Festival by going to BV Archives.